Dec 2nd, 2012 06. 20 am. I gave birth to a wonderful little angel. My first child is a girl. 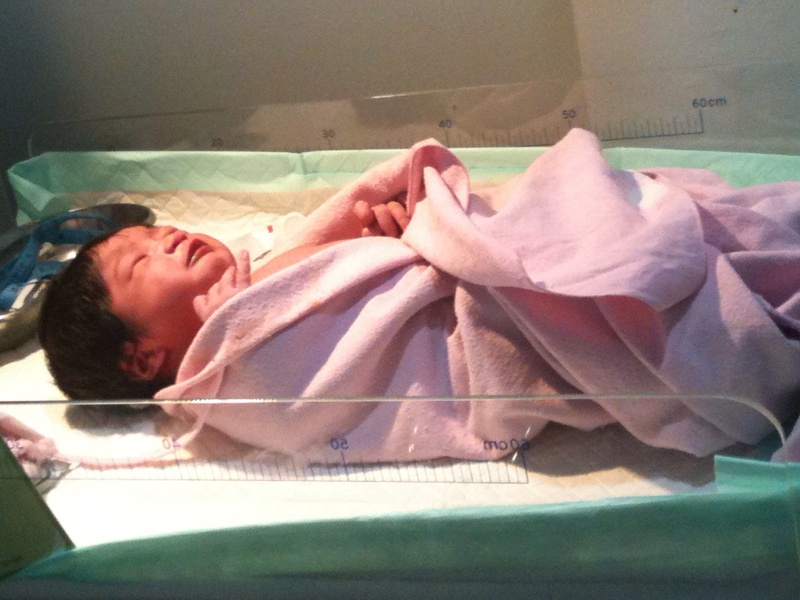 So beautiful, twinkle twinkle tiny light (even though she was 3.7 kilos and 54 cm length). She was put on my chest, made a little move. I couldn’t say a word, she is so perfect, her eyes seemed so hard to open. She tried to lift her head and catch the air, her mouth open n close looking for something. Even I was so sleepy after a whole day of labor process, I lifted my hands to touch her skin, soft as a moon glow. You are the adorable, “Arawinda Neura Zahira”. I woke up suddenly when I felt my water was broken. My mom and my husband already at the airport, I called… ” I think I will deliver the baby soon, Iam sure this is the symptoms”. Well, after 9 months of happy pregnancy ( because I didn’ t get morning sickness, I ate a lot … mm ..too much maybe, and have a loving husband who always stand by me), I felt Iam ready. Yes, I’ve read everything about pregnancy and childbirth, breastfeeding, even I learnt to sing some children songs, I convinced myself again, ” Iam ready”. So what should happen next? Blood, there must be a little blood. Ok, here we go, I immediately called the hospital and dr Eighty Mardiyan K. My mom canceled the flight, my husband directly went home, my brother made the car ready. Short of story, I must in bed, they gave me a labor induction, I controlled my breath, focused on the happy things. Almost a happy contractions … 😀 well, I could deal with the pain because I have supports from everyone, Iam the luckiest mom…and it came again, every 5 minutes, hurt .. Uuhh.